The perennial doormats are suddenly a few wins away from their first conference title in 106 years. Brock Purdy and Iowa State have beaten five consecutive conference opponents for the first time in program history. For most of the century-plus that Iowa State has been playing college football, the Cyclones have toiled in misery, the doormat of virtually every conference they’ve been a part of. That neighboring programs at the University of Iowa and University of Nebraska rose to national prominence, in part at the expense of the Cyclones, no doubt made this fact more painful for the faithful in Ames. But despite losing to Iowa in the first game of their season, the No. 16 Cyclones are the class of the region this year. At 6-3, Iowa State’s record doesn’t jump off the page, but coach Matt Campbell has turned the program around. In 2017, Campbell’s second season on the job, the Cyclones snapped a seven-year streak of losing records and capped the season with a win in the Liberty Bowl — just the fourth bowl victory in school history. Now currently on a five-game winning streak against conference foes,1 including two wins over ranked opponents, Iowa State has a chance to play in the Big 12 championship game if it beats Texas on Saturday and Kansas State next week, and West Virginia loses either to Oklahoma State or Oklahoma. The Cyclones haven’t won a conference title since before the television was invented, last doing so when they were a part of the Missouri Valley Intercollegiate Athletic Association. Even being ranked this late in the season has the Cyclones on the brink of another accomplishment: The team has finished a season in the Associated Press rankings only twice in school history — and never higher than 19th. 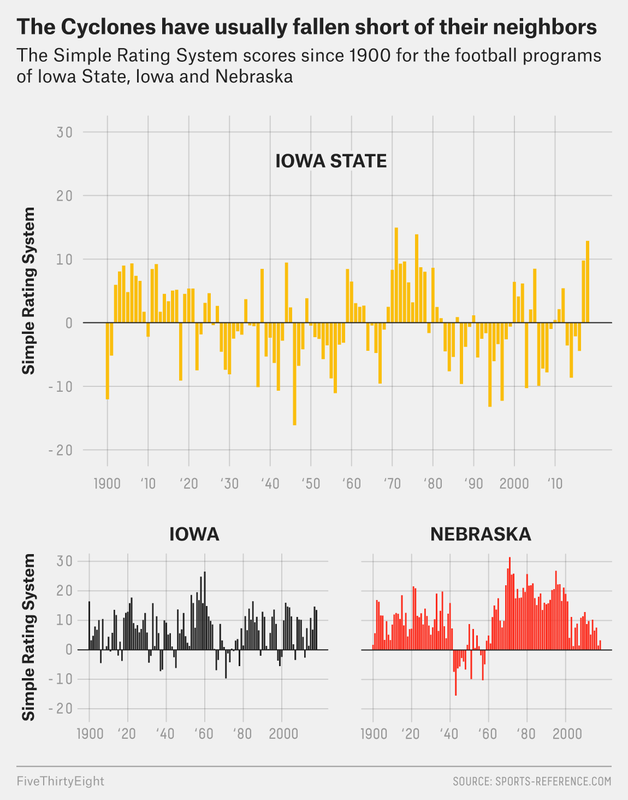 By comparison, their rival to the west, Nebraska, has finished 48 seasons in the rankings. Iowa State is 12.89 points better than the average team this season, according to Sports Reference’s Simple Rating System. That would be the team’s third-best season of all time and the best mark since 1976. Not bad for a program that, through the 1990s — despite having a transcendent talent at running back — averaged an SRS of negative-4.7 and won less than 26 percent of its games. Campbell, at least at podiums, is hardly satisfied. “I think what’s exciting is that I sit here right now knowing that our best is still out there,” he said after the team’s most recent win. Iowa State’s five-game winning streak coincides with Campbell’s decision in early October to play true freshman quarterback Brock Purdy, who spurned a scholarship offer from Alabama. Purdy’s Total Quarterback Rating of 85.0 trails only Shea Patterson of Michigan (85.2), Kyler Murray of Oklahoma (95.3) and Tua Tagovailoa of Alabama (95.8). Purdy has an elite target in Hakeem Butler, the successor to recently graduated star receiver Allen Lazard. At 6-foot-6, Butler is a ball-hawking skyscraper who ranks second nationally in yards per reception (22.7) and share of receptions resulting in a first down or touchdown (86.1 percent). Add in a bruising tailback like David Montgomery — a consensus first-team All-Big 12 selection from a season ago who has amassed 1,108 yards after contact over the past two seasons, the fifth most of any running back — and the Cyclones have a frightening offensive triumvirate. In the seven seasons under Paul Rhoads, Campbell’s predecessor, Iowa State never ranked in the top 50 in offensive efficiency, but the team is on track to crack it for the second season in a row. But the pulse of Iowa State’s success is in the dominant defense installed by Campbell and defensive coordinator Jon Heacock. This season, the Cyclones rank 13th in defensive efficiency at 79.22 — 8.79 points higher than any previous season in the previous 10 years and 30.62 points higher than their average over that stretch. Iowa State leads the Big 12 in rushing yards allowed per attempt (3.1), opposing passer efficiency rating (125), yards allowed per play (4.94) and opponent drive score percentage (25.9 percent), among other metrics. The Cyclone defense displayed its chops on Oct. 13 against West Virginia, which touts a top-five passing offense (337.3 per contest) and top-10 scoring attack (40.89 per contest). Will Grier, a likely Heisman finalist, was held to a season-low 100 passing yards, and the Mountaineer offense managed just 7 points. (West Virginia finished with 14 total points, but 7 came by way of a blocked field goal returned for a touchdown.) “We didn’t do anything right,” West Virginia head coach Dana Holgorsen said afterward. Iowa State’s toughest assignment left on the regular-season schedule comes Saturday against No. 15 Texas, before the Cyclones close with matchups against Kansas State and Incarnate Word.2 But that last game, scheduled for Dec. 1, would be canceled if Iowa State can reach the conference championship. For decades, conference foes worked Iowa State like a speed bag on Saturdays, turning Jack Trice Stadium into a virtual burial ground. Opposing coaches like Tom Osborne at Nebraska and Hayden Fry at Iowa inflicted substantial punishment, year after year. But under Campbell, the cardinal and gold have shown that they won’t be pushed around. FiveThirtyEight’s Elo rating pegs the Cyclones higher than it does Central Florida, a team largely crowdsourcing its playoff candidacy but that does have the nation’s longest current winning streak. A win Saturday in Austin, a game some consider to be the program’s most significant in the past decade, wouldn’t vault Iowa State into the playoff conversation. But it would rubber-stamp a growing notion: The Cyclones — yes, those Cyclones — are finally ready to contend. A feat never before accomplished by the team. The last game was added after Iowa State’s first scheduled game was canceled because of bad weather.